Manti drama students collectively earned enough points at the state drama competition to take first place. MANTI—The South Sanpete School District got a real treat at their monthly board meeting last Wednesday when two smartly-dressed students—a second and fifth grader—conducted a tour of Manti Elementary. Principal Karen Soper was beaming after the tour. “Students know what they know and they are empowered,” she said. Board members then shared what they had learned at the recent National School Board Association, held recently in San Antonio, Texas. Gary Olson commented on classes that examined charter vs. public schools. In Arizona, for example, about 35 percent of students attend charter schools. Surveys asked teachers and parents why they sent their children to charter schools. The survey said teachers felt more appreciated, and likewise, parents felt better treated in charter schools. Board member Mark Olson attended lectures on different kinds of schools. “Our district doors and principals’ doors are open all the time,” he said. He also wondered if trade classes offered in one school could be extended to students from another school. “What if we had a Manti High student who wanted to attend a trade class being taught in Gunnison?” he asked. District Superintendent Kent Larsen talked about personalized learning, as well as school security. “We feel good about keeping up with law enforcement officers locally,” he said, “but the FBI wants to conduct a training exercise sometime after school is out to fine-tune our cooperation with law enforcement.” He also said he had talked to Gov. Gary Herbert, who likes what we are doing in our rural schools, and wants to continue follow-up meetings on school security. Mark Anderson, who is the CTE coordinator for several school districts, discussed how career pathways are being refined for students who want to focus on a career early enough in schooling to take relevant classes in high school, as well as college. 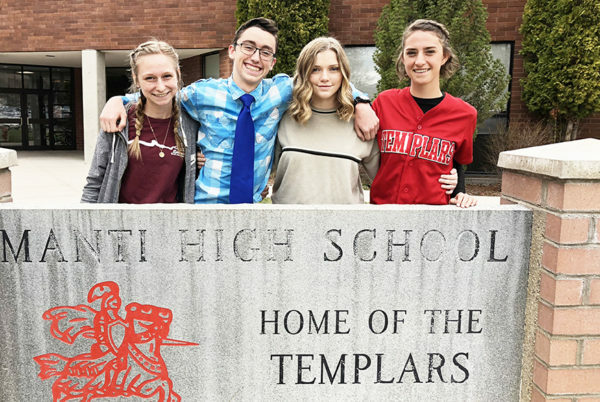 Utah’s “Talent Ready Effort” aims to help high-school students select pathways they are interested in and then coordinate efforts with higher education. “For example, Snow instructors in one field really don’t know who their counterparts are in high schools; and vice-versa, high school teachers don’t usually connect with secondary teachers. If they connected better, high school teachers could better prepare students for related college courses,” he said. Finally, the last goal is to engage community and industry partnerships to make sure pathways are relevant. “If a student can come out of education with certifications in certain fields, that should make them more attractive to industry and business needs,” he said. 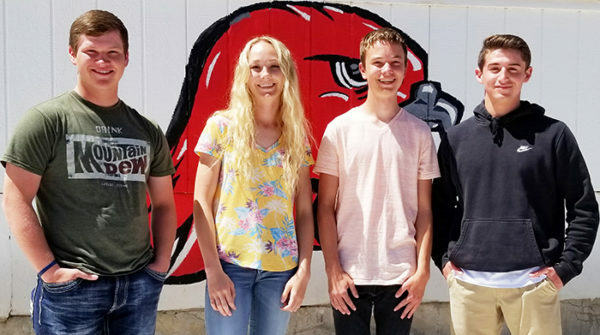 At North Sanpete High School, the newly elected student body officers are (L-R) Activity Agent Brock Justesen, Secretary Linzy Flinders, Vice President Kaleb Cox and President Chance Clawson. Those who decided to run were narrowed down to two finalists per position and then students voted again to decide the winners. Ezra Hainsworth, former student body president and currently Dixie State student body president, spoke to the students at an election-day assembly. At Gunnison Valley High School, new student body officers are (front, L-R) Activity Director McKenna Taylor, Publicity Manager Tiandra Taylor, Web Master Teersa Payne, (back) Vice President Jared Chivers, Secretary Meg Childs, President Ruth Lyons and Historian Thomas Yardly. At Manti High School, the new student body officers are (L-R) President Karli Arnoldsen, Vice President Marcus Adams, Service V.P. Sara Neilson and Public Relations Danielle Hatch. On the evening of Friday, April 20, the Family, Career and Community Leaders of America held a movie night as a fundraiser. For $2, students and community members could enjoy the classic John Wayne movie “McLintock!” Tonight at 6 p.m. is the choir concert at the school. 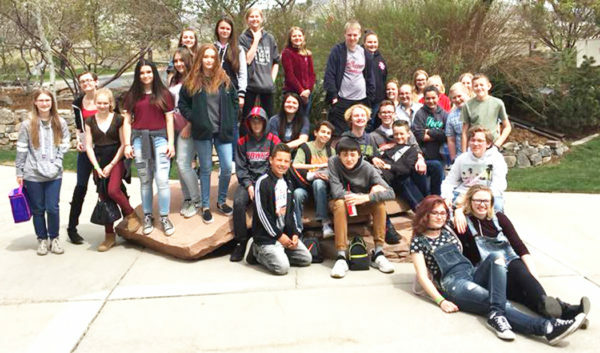 On Friday, April 20, seventh- and eighth-grade Family and Consumer Sciences Exploration students enjoyed a fieldtrip to Thanksgiving Point where they learned about careers in food science, veterinary medicine and museum exhibit creation. On Friday, April 20, Christian Sanchez, a senior GEAR UP student, met with Leadership in Action students to talk about high school transition and success. an afternoon assembly. Today is Throwback Thursday where students can wear clothes from past eras. More dodgeball will take place, and lunchtime is 15 minutes longer than usual. Tomorrow is Fashion Disaster for clothing, and French Toast Friday follows with a dodgeball championship at the morning assembly and an extended lunch again. Sophomore Cheyenne Ballard has been accepted to a Harvard Medical School summer camp this summer. On Wednesday, April 18, students from Justin Morley’s cyber corp and entrepreneur classes teamed up with GEAR UP for a visit to Adobe. While there, students were able to learn more about computer technology, business and marketing. 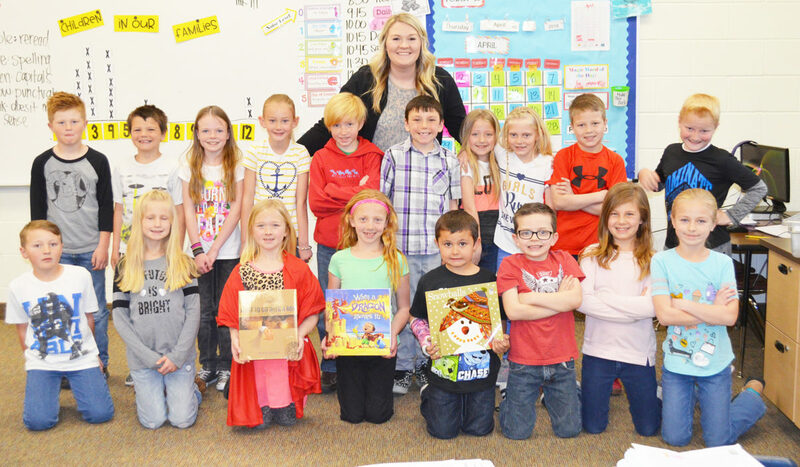 On Friday, April 20, for National Teach Children to Save Day, Zions Bank’s Manti Financial Center Manager David Warren visited Manti Elementary School’s fifthgrade students and taught them about needs versus wants, budgeting and ways to cut spending. On Friday, April 20, the PTA sponsored Parents and Pastries where parents came and read to their students and enjoyed some breakfast pastries together before school. The school recently won a $500 educational grant in the Spring 2018 Create Real Impact awards for being one of the schools with the largest number of entries in the contest for creative efforts to address the dangers of distracted driving aimed at teenagers. 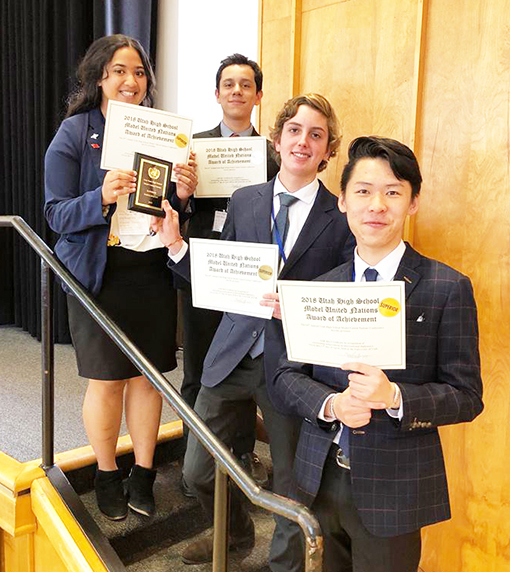 At the University of Utah Model United Nations competition, Enrique Roces and Lavi Tuineau received the top award, Distinguished Superior Delegates in Security Council. William Wang receiving a Superior Delegate award in Economic and Financial Committee, and Emanuel Flores receiving an Excellent Delegate award in General Assembly Plenary. There were more than 500 delegates from schools across Utah at the competition. Students enjoyed 15 different groups/performers at a talent show assembly on Wednesday, April 18. 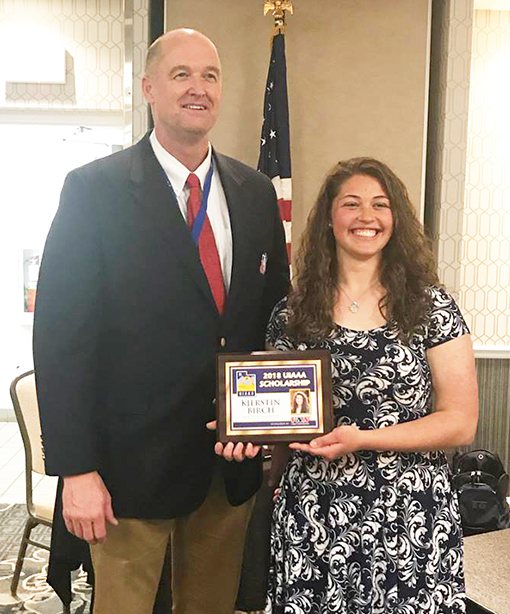 Senior Kjerstin Birch received the Utah Interscholastic Athletic Administrators Association scholarship last week at the association’s annual conference. 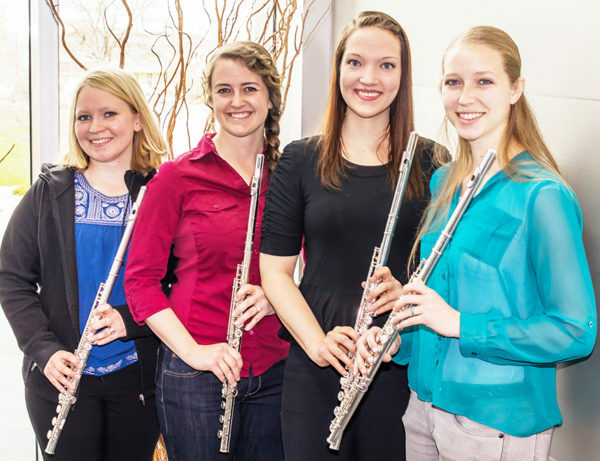 EPHRAIM—Flutists at Snow College have accomplished much and received significant honors. Jamie Baker Sommercorn and McKenzie Howell, both seniors, have performed their senior recitals and auditioned for master’s degree programs. Five flute students at Snow College were recently honored (L-R): Anna Clawson, Jamie Baker Sommercorn, McKenzie Howell and Jennifer Richards. On the Wind Symphony’s recent concert tour to California, they were each chosen to be a soloist. Sommercorn is the section leader in Snow Orchestra, was chosen to be solo flutist last summer for the Nauvoo Band in Nauvoo, Ill. The Utah Flute Association chose her as first place winner and performer in the college soloist competition. Howell was chosen to be a performer in Paris, France, for the Da Capo Alliance Flute Master Class two years ago and studied with some of the top flutists. Anna Clawson, a junior, has won a scholarship this year to go to Paris and participate in the same master class this summer. She also plays with Snow’s Orchestra and Wind Symphony. Jennifer Richards, a junior, also plays in the Wind Symphony and participated in the Utah Flute Association College Performance, winning first place for her solo. 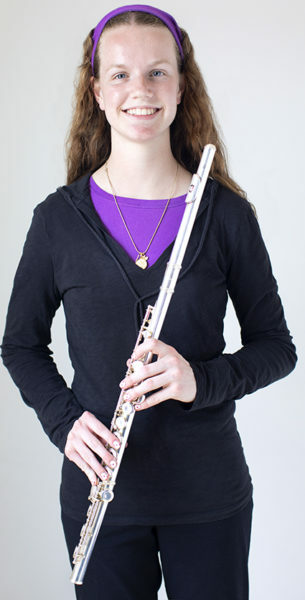 Amanda Kjar, a sophomore, placed third for her solo in the Utah Flute Association competition. She plays with the Symphonic Band at Snow College. Kjar is a student of new adjunct teacher, Amy Leiniger. Jorgensen said a gentleman conversing with some of the student musicians was surprised to learn the students practice five to six hours a day when getting ready to perform. Scott Larson, Rep. Raymond Ward, Ward’s daughter Lucy and Jeffery Putnam enjoy a preshow reception at the Eccles Theater in Salt Lake City. Afterward they attended “Hamilton,” a musical. MT. 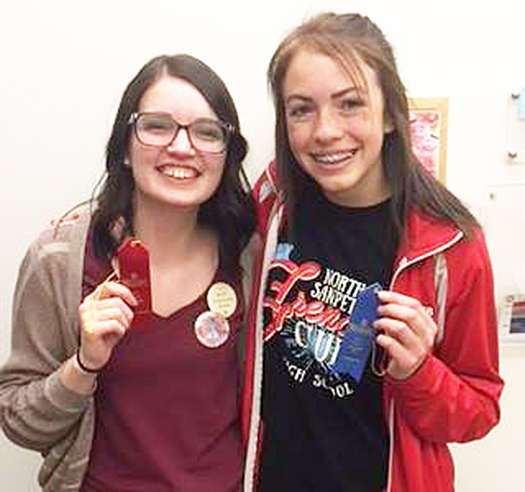 PLEASANT—Two North Sanpete High School students recently became the envy of many of their family and friends. Jeffery Putnam and Scott Larson won tickets to one of the performances for the highly acclaimed and sold-out Broadway musical “Hamilton,” which is currently playing at the George S. and Dolores Doré Eccles Theater in Salt Lake City. After each writing a letter to an elected official and submitting it through an online portal, Jeff and Scott were chosen in a random drawing. In his letter, Jeff proposed a solution to bullying, while Scott expressed his opinion that some school classes are unnecessary and suggested that classes which teach about the court system or how to handle personal finances would be more relevant. 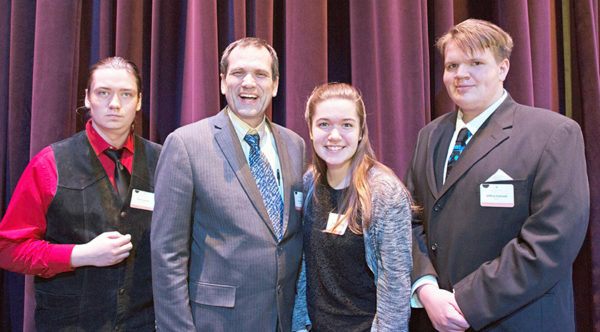 From close to 700 entries, two students from each legislative district (both House and Senate) were chosen and, where possible, attended with their legislator. In Jeff and Scott’s case, scheduling conflicts led to them being unable to attend with Rep. Derrin Owens. Instead, they were accompanied by Rep. Raymond Ward of Bountiful. Scott, a junior at age 16, had actually forgotten he had entered the contest when his mom found out he had won. Scott said he was surprised by the hip hop music the play is set to. “I think it was smart that they did it in hip hop to try and bring in my current generation to the arts,” he said. Scott said he has never been to a Broadway play or anything like it but would like to go to others if given the chance. Jeff, age 15 and a sophomore, on the other hand, is a big fan of Broadway musicals. Prior to attending the performance, he had heard about “Hamilton” from friends and had educated himself about the production, even downloading YouTube videos of people lip-synching numbers from the show. Jeff said the show lived up to his expectations and that meeting the cast was amazing. The State Legislature paid for the students’ tickets with part of a $350,000 appropriation lawmakers approved for Alexander Hamilton-related education. Elected officials paid face value for their own tickets. The contest was part of the New Nation Project, a series of events presented by the state of Utah to celebrate the founding era of America. 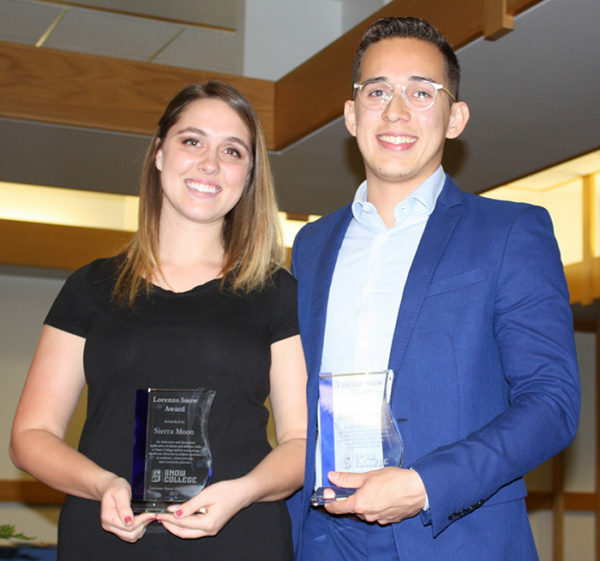 Sierra Koceja-Moon and Brais Marchena are this year’s Snow College Lorenzo Snow award recipients. North Sanpete Middle School students are getting hands up in technology at an afterschool coding club (front, L-R): Ryder Draper, Joseph Holbrook, Chase McCormick, Landon Millsap, Ethan Freeman, (back) Tanner Kerksiek, Phaedra Lamb, Jordan Rainey, Michelle Lee and Jenna Hill. 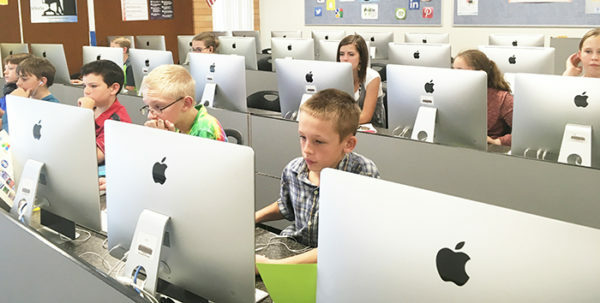 MORONI—Although not offered as part of the curriculum, North Sanpete Middle School students have the opportunity to learn computer skills through a STEM (science, technology, engineering and math) coding club held after school every Wednesday. The club, which is open to any student, is led by Carey Ivory, career technical education/business teacher. The whole purpose of the club is to give kids an experience with software programming, Ivory said. Ivory said the club is pretty much kid-driven since she only knows the basics of computer coding. After completing a series of levels, the club members take it from there. She simply turns her computer lab over for their use. About 25 students are members of the club this year, and each week about 10 show up. Each works alone on a project. Five members of the club this year are girls, and Ivory said that is a higher number than normal. While at the computer lab, club members have the opportunity to build robots or develop apps or programs. The first option is always the most popular. Currently five kids are building robots. Often, students will come in on their own time or during flex time to work on their robots. At the end of the year, club members have their robots compete against each other in Battle of the Bots in an “arena” where they have to perform a series of tasks. “It’s a fun event the kids really look forward to,” Ivory said. In the beginning, Ivory paid for the robot kits out of her own pocket and ran the club for free. These days, GEAR UP provides the kits and gives Ivory a small stipend. Although she doesn’t have anyone working on apps or programs right now, when she does, Ivory uses a program called Xcode, which utilizes a Swift language. Once each year, Ivory takes club members, along with Future Business Leaders of America (FBLA) members and her business class, on a fieldtrip. On April 5, they visited Wavetronix, a Provo-based international company that develops high-definition radar systems used to monitor and manage traffic. During the fieldtrip, the kids got to see how the radar systems are made and found out about careers in software programming. Last Friday, April 13, students and their parents enjoyed a PTA-sponsored Family Movie Night. They brought their pillows, blankets and favorite lounge chairs and enjoyed a showing of the movie “Coco” along with treats. The school has announced its teacher placements for next year. Parents are being encouraged not to request a specific teacher for their students. If they have valid concerns, they can fill out a teacher request form at the office until May 1. 4H will be sponsoring a pizza dinner tonight at 5:30 p.m. ($2 per person). This is before the PTO Literacy Night which begins at 6 p.m. Students and families can enjoy readings and performances of various books throughout the school from 6-6:30 p.m. At 6:30 p.m. 4H will host free crafts and projects for the kids. The PTA Book Fair is going on all this week. All books are buy one, get one free. The sixth-, seventh- and eighth-grade bands participated in the Vance E. Larsen Band festival at Snow College on Tuesday. Class elections are being held this week. SAGE testing has also begun. The SMILES Dental checkup 24 will be Tuesday, April 24. The Senior Ball and dinner was held on Friday, April 13, at the school. The wrestling team is sponsoring an unusual fundraiser. 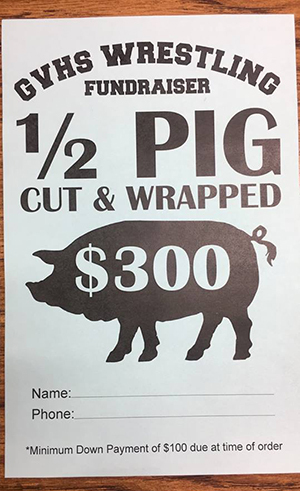 Parents and friends can buy half a pig to help support the team for next year. Forms can be picked up from Andy Moysh before school ends. On Monday, students participated in internet safety assemblies, and yesterday they enjoyed a talent show assembly. This Saturday is the Sadie Hawkins dance at the school. 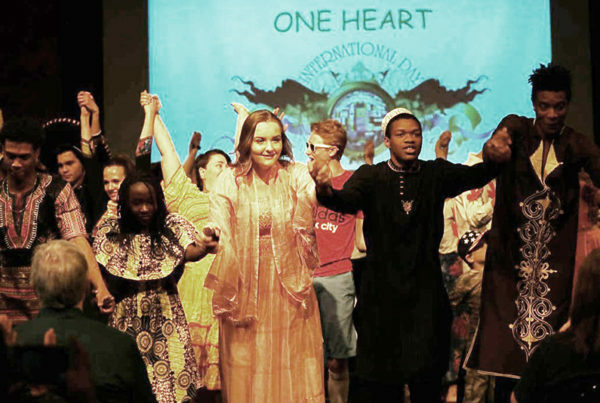 The North Sanpete High School chorus took first, and band took second at the San Francisco Heritage Festival put on by Worldstrides Onstage last week. 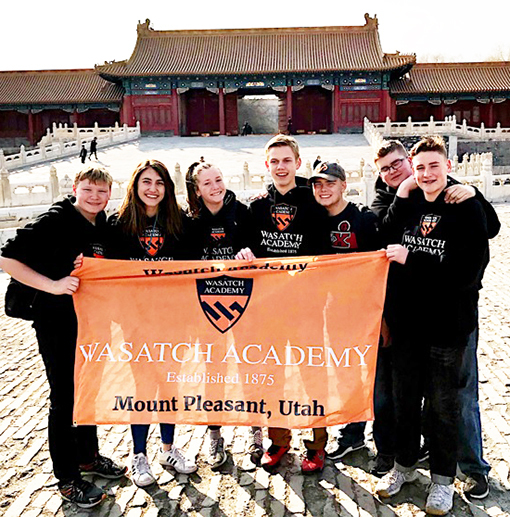 During spring break, seven Wasatch Academy students traveled to Chengdu, China, to visit Shishi High School, a partner school with Wasatch Academy where students can earn dual diplomas from both Wasatch and Shishi. They also visited Beijing National Day School, another partner school in Beijing. In January, Wasatch Academy students hosted students from Chengdu. 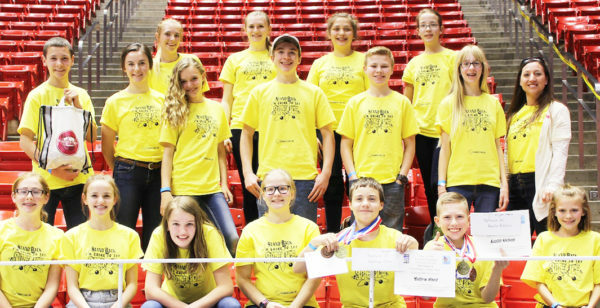 Despite going into the Utah State Science Olympiad with an obvious handicap, Ephraim Middle School’s team still performed well. There are 24 events in the Olympiad. But the Ephraim team did not qualify for state in Hovercraft at region this year. Seventeen eighth graders participated in 23 of the events in the areas of: life personal and social science; earth and space science, physical science and chemistry; technology and engineering design; and inquiry and nature of science. Flitton said she has a large group of volunteer parents who help coach team members. “I just go out and find parents who already have majors in the different areas and who are willing to get in and get their elbows dirty,” she said. Kaulin Neilson and Matthew Olsen took first place in Battery Buggy by building a battery-powered robot to complete an obstacle course. The two students also received second place in Wright Stuff, where teams build a wooden airplane powered by a twisted rubber band. The team whose plane flew the longest won the event. The entire team received the Spirit of Sportsmanship award, which is given to the team that best exemplifies good sportsmanship, team collaboration and school spirit. A team from Manti High School also did well at the Olympiad. While there are usually 15 members on Manti’s team, since the Olympiad was held on Easter weekend at the end of spring break, just seven team members made it to the March 31 event at the University of Utah. Despite their small numbers, the Manti team competed in 20 of the 24 events. Each team member competed in multiple events. At the end of the day, the team finished a respectable 19th out of 27 participating schools. “The students who went did really well; they worked really hard on their events,” coach Jared Eliason said. Junior Andrew Olsen did particularly well. He competed in four events with his partners and placed in the top five in all of them. Andrew and his partner Meagan Dennis took second place in Towers, a competition where teams design and build a tower to carry a maximum standard load. The tower must span a predetermined opening and support a load at a minimum height. Andrew and Hope Marsing took third place in Mousetrap Car, an event where teams design and build a vehicle which uses one or two single-spring mousetraps as its only sole source of energy for propulsion. Meagan and Andrew took fourth in Helicopters and fifth in Mission Possible, where they designed and built a device that uses a chain reaction to accomplish a simple task in a complicated manner. EPHRAIM—Three choirs at Snow College will perform an evening of Country-Western hit music on Thursday, April 19. The concert, titled “Mountain Music,” will feature Cadence Chamber Choir, Advanced Women’s Choir and A Cappella Choir in the Jorgensen Concert Hall in the Eccles Center for the Performing Arts in Ephraim. In addition, Snow College students and faculty will sing back-up for the choirs. This concert is appropriate for children 8 years of age or older. Tickets are $5, available at the Snow College Horne School of Music Box Office. The concert is free to Snow College students, faculty and staff, and $1 for high school and junior high school students with ID. Students in Whitney Wheeler’s second-grade class at Mt. Pleasant Elementary are excited to begin reading the books they received as a result of Ripple’s donation to Donors Choose. Manti High School’s team took first place in its division at the Snow College math contest. EPHRAIM—Local students finished strong in last week’s annual math contest at Snow College. A total of 385 students from 24 public and private schools participated in the math contest this year on Tuesday, April 3. 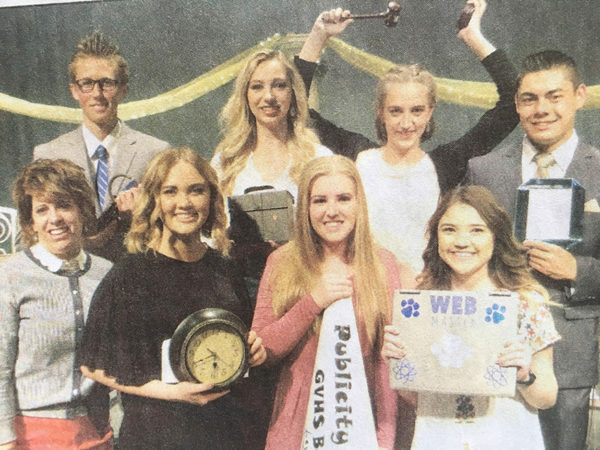 Wasatch Academy won first in its division, Manti High won first in its division and many local students placed in the top 10 in their divisions. Students compete against each other in a timed test, and the students are not allowed any calculators or aids. In the senior division (grades 10-12), students try to answer 40 questions in two hours, and a “team” consists of the top five scorers from each school. A team from Wasatch Academy took first place in their division of private and charter schools with a combined score of 524. Team members swept third through eighth place. John Kim placed third with a score of 124, George Zhao fourth with 120, Wending Wang fifth scoring 111, Winnie Li sixth with 86, Brian Lyu seventh with a score of 83, and David Liu placed eighth with 78. Manti High’s team took first place in their division (schools of 310-619 students) with a combined score of 253. In their division (Division 3), Manti and Gunnison swept the second through eighth places, following closely behind winner Chandler Williams of South Sevier. 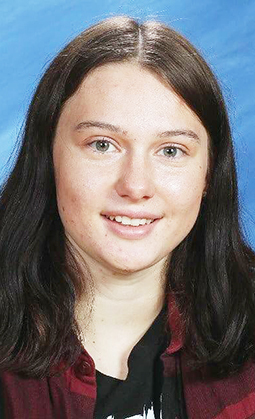 Manti High’s Breanna Hedelius took second place with 56 points, followed by third-place winner Ethan Morgan with 54. Korbend Cox took fifth place with 50 points, Russell Christianson scored 46 and took seventh, with Kjerstin Birch placing eighth with 42. As second- and third-place winners in their category, Breanna and Ethan will each receive a one-year full-tuition scholarship to Snow College (worth $1,800) and a Math Jock T-shirt. Gunnison Valley students Alexander Stewart scored 52 and Gabriel Jensen scored 49, taking fourth and sixth places respectively. In the junior division (grades 7-9), students have 20 questions to answer in one hour. In the junior division, in ninth grade, Eric Yang of Wasatch Academy took third place with a score of 51. In each category, the five members of the winning team (determined by combining individual scores) and their math instructor each receive a Math Jock t-shirt. The annual contest was started in 1977 by Bart Nelson and Ted Olson. The college’s math department has been sponsoring it ever since. The junior division of the test began in 2007. 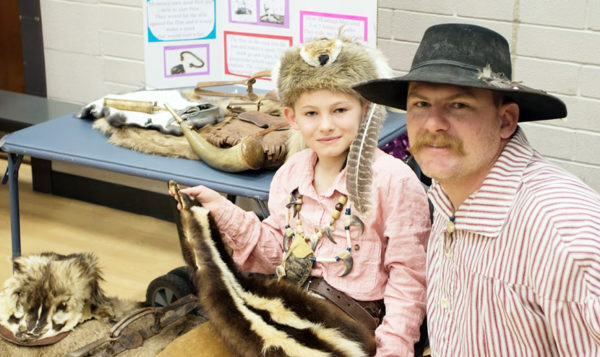 Ephraim Elementary student Wyatt Mann (left) with his dad, Josh Mann, share their love of mountain men during the school’s Jr. Genius Fair. EPHRAIM—What can make students more satisfied than participating in something they enjoy, are curious about and is not required? That’s what 130 Ephraim Elementary students feel—quite satisfied—after participating in the school’s annual Jr. Genius Fair on Friday, April 6. For months, students from kindergarten to fifth grade have been preparing for the fair, which is much more than a science fair. Participation in the Jr. Genius Fair is optional. This extracurricular activity is designed to teach students how to research a topic of their choice. With no requirements or even guidelines, students get to choose what they’re interested in or passionate about. This year those topics ranged from Star Wars to chocolate. Students check out books or videos from the school library, and Shauna Wayman, the school’s librarian and the event’s organizer, helps students negotiate the internet to find what they are looking for. As they prepare their topic, students can choose to attain various levels based on the depth of their research. To earn the level of Specialist, students read four books, one magazine article, one encyclopedia entry, look up one internet reference and complete two out of 10 other activities that will help them learn more about their topic. For the Expert level, students read six books, two magazine articles, one encyclopedia entry, two internet references and complete four out of the 10 activities. For the level of Genius, students read eight books, two magazine articles, one encyclopedia entry, three internet references and complete six of the 10 activities. Those activities each must relate to their chosen topic and include watching a movie or TV program, visiting an information place, interviewing a knowledgeable person, making a short book or pamphlet, finding a club or group, writing a poem, making up a PowerPoint presentation or movie, trying to stump the principal with a question, giving an oral presentation to their class or making up a game, puzzle or word search. Each student participating in the program makes a display about their topic and presents it during the Jr. Genius Fair. This year there were 85 displays (students can work in teams of two or three if they choose). Many get really into it, dressing up in costumes. This year’s subjects also included slime, Helen Keller, scorpions (the student caught wild scorpions and displayed them in a cage), pets, rocks, crystals, buffalo skeleton, sharks, mountain men, the Titanic and tropical birds. Principal Gannon Jones visits every display and asks students questions about their topic. At the end of the day, participants each get a special Jr. Genius treat. They are also recognized with certificates at the end of the school year.